As 2011 draws to a close and we make space for 2012, there is one thing that I ask you to make time to do this January. It’s our Futures Interview. Hosting these interviews over the last six months have been one of the highlights of my year. Every single interview I read, no matter the age, profession or location of the person, has been a lesson and an inspiration. If I had five minuties with every human being on this planet, these are the questions that I would ask them. I believe that every single one of us has ideas and experiences to share that can lead us to a brighter future. We spend much of our waking lives limiting ourselves, our beliefs, our power, our dreams, our actions. But when you look though history and the present, we see that people only create change in their lives and in the world by believing that more is possible than meets the eye. Through the process of taking part in our Futures Interviews, you have the opportunity to figure out what it is that you really believe in, and to think through and vocalise your core values. We all make choices in our lives on how we spend our time, energy and money, and it is these decisions that collectively shape our world. The Futures Interviews ask you to stop and imagine the world that you wish to live in, and then share the ways that we can Think, Act and Vote to create it. There is no criteria for who can answer these questions and take part. Everyone can, you can. Please make time to do this, and to share this with your friends and family all over the world. There are too many problems with our world and our communities right now, and it can seem impossible to create something different. Yet it’s only by thinking differently, acting differently and voting differently that we can create the change that we want. So let’s move into 2012 with the courage to live out our values and learn from each other to create a brighter future for all. Take Part in Our Futures Interview Series. 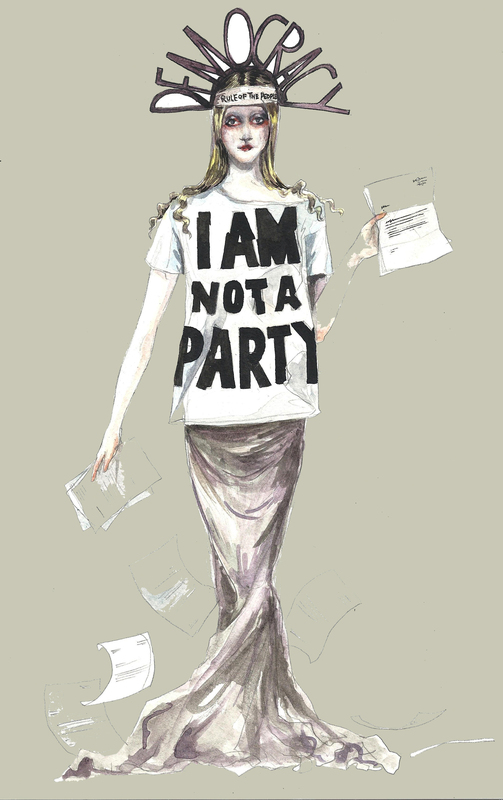 This illustration was created by Faye West for the Think Act Vote Futures Exhibition, bringing to life the words of iconic fashion designer and activist Katharine Hamnett.